Another enjoyable weekend. Friday was a short day, because I started work at 6am and then I took four hours leave to enable me to visit the dentist where a double filling awaited. Actually I always find that the most painful part about the dentist is the bit with the debit card at the end, but I’d paid for my treatment in advance – and so long ago that I’d forgotten how much it cost, so it was only the numb mouth and dribbling everywhere that I had to worry about. Then it was home to do some hoovering. We’ve invested in an industrial hoover, which may seem a little excessive for our little two up two down, but I only have to look at a vacuum cleaner and it’s broken. I don’t actually have to do anything. Seriously! We average 2 per year. This new one is pretty impressive and so far remains undamaged, though I’ve only used it the once. It also has a wet extraction facility (I can hoover and wash the floors simultaneously) which is very exciting. Friday evening saw Heather out with the cronies she used to work with at the old Mayfair club in Newcastle. When she tells people she used to serve behind the bar there, everyone seems to be nearly as impressed as they are when I tell them I used to work in Windows of the Arcade. No one is very struck with either of our current occupations. Heather decided she would need to leave her car at work and take the metro into town. Clearly there was no way she was going to leave her precious Hyundai in Newcastle overnight, but she could see no valid reason why the same should apply to my Micra. 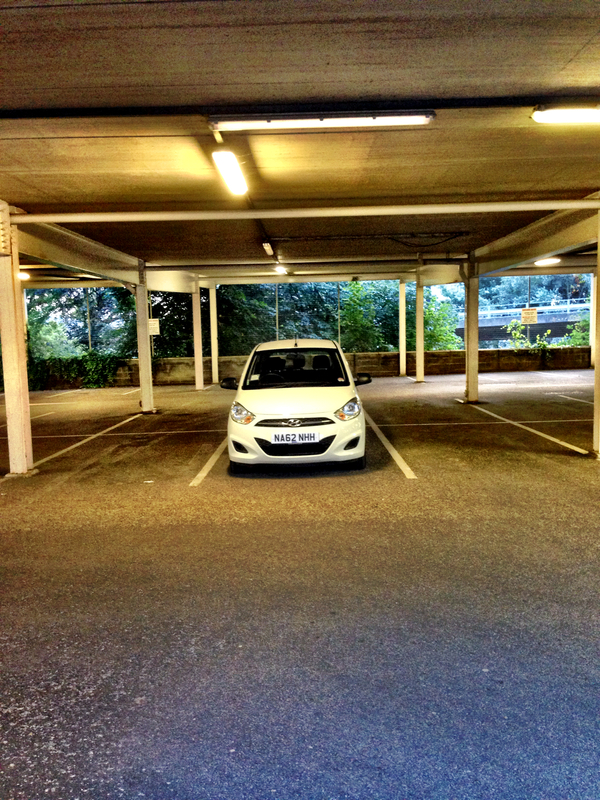 So she took that to work instead and I was allowed to have the Hyundai. As I’ve already explained, I did a short early morning stint that day, and she texted me at 7am to find out if I’d remembered to switch the headlights off. She was clearly fretful, so I went back outside and took a photo of the damn thing to prove that the lights were very definitely off. You will see that I take great care to park it well away from anything or anyone, even if it means I have to walk a couple of miles. This Sunday sees Heather and me off to watch Newcastle in the first game of the Premier League against defending champions Manchester City. If you fancy seeing a game of proper football however, at an international venue, you could do a lot worse than to go along to watch Gateshead FC or “The Heed” as they are colloquially known. 3pm on Saturday afternoon found us settling in our seats to see them challenge Torquay United (freshly relegated from the Football League) and beat them 3 – 1. Gateshead narrowly missed out on promotion last season, making it all the way to Wembley for the play-off only to have victory snatched from them by Cambridge United. Heather made the trip to London, but unfortunately I was otherwise engaged (my mother). We are both confident that Gateshead will assume automatic promotion in 2015 and if not, then at the very least another play off. We have already booked the Wembley Premier Inn. I thoroughly enjoy going to see the Heed, I care about the outcome and entry doesn’t cost a fortune. A mince pie and a cup of tea at half time are affordable, and a friend has suggested that we occasionally upgrade ourselves to corporate hospitality status for a treat. I think we just might. At St. James’s Park last season I bought a mince pie for three quid. Sitting next to me just happened to be a chap who worked for whoever it is that supplies the pies, and who was in charge of delivering them to the ground. He told me that the cost price is 69p per pie. 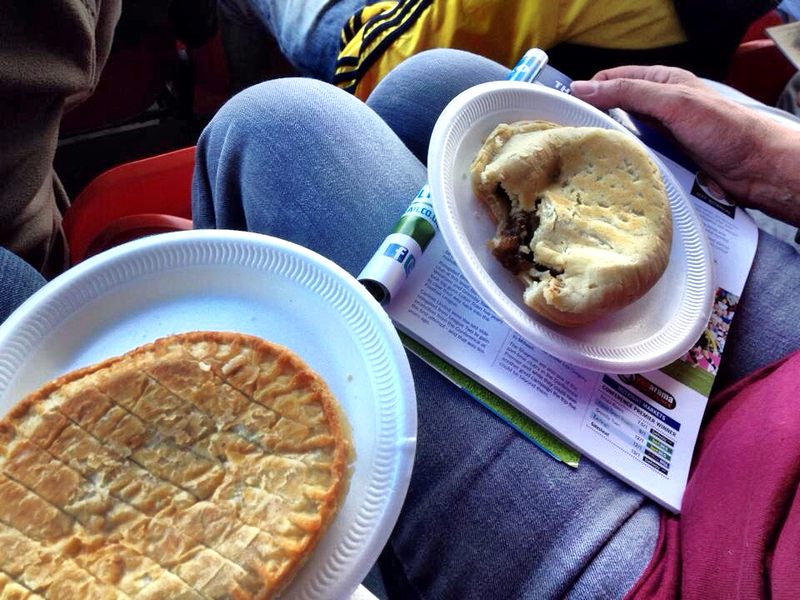 Gateshead FC charge a pound and the pies are HUGE! Hopefully under manager Gary Mills the Heed will go on to be huge as well. That is why Mr ASHLEY is rich…your mum will still be in pain however i know that you are there …. £3.00 for a pie at SJP. So where does the £2.31 profit go? Is Mr Ashley falling on hard times?